There will be more decks coming. How do they do this? Yelling around the room? are they able to look at the card being incorporated? Yeah, actually I’m still working on this game and ironing out some bugs, we played it the other week for the first time at Salt the other week and it worked pretty well. I think what you need is perhaps a captain for each team who is in charge of getting their full story together, and then the captains meet in the centre of the room after the minute and trade with each other no more than 2 people per round. It’ll mean that you need to make sure each captain has 1 card from a separate story to the other captains, and then you’d shuffle the remaining cards in the deck and deal them out to the rest of the players. Yelling around the room was how I envisioned it but it didn’t work so well… And yes, if they see the card they’re getting then they’ll turn people away, so the card needs to be kept secret. What happens if one captain comes up with 1 person and another 2 people? Does that mean some teams have more than 5 people over time? or that it will just work out given the amount of cards and people? Would be to give each team of 5 three stories (mixed up) and get them to sort them out in 10 mins or something? Sorry if i am being a pain! 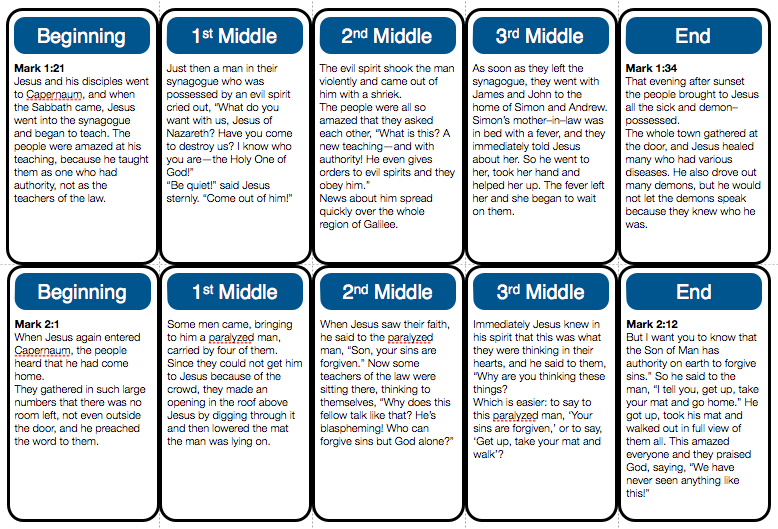 Ok, so… After you form everyone into teams of 5 you can work out how many bible stories you’ll use from the deck (ie. 10 teams = 10 stories. There’s 12 stories in a deck so remove the remaining 2 stories). Designate a captain from each team of 5 and deal out 1 card from each of the 10 stories (maybe just give them the “beginning” card from each story), that’ll leave 4 cards for each story. Shuffle the remaining deck of cards and distribute randomly. You should now have 10 teams where the captain has the beginning of a story but the rest of the cards in the team are mixed up (though the law of averages will mean that there could be 1 or more other card/s in the team that matches the captains story card). When the trading period begins (after the 1st minute), the captains meet in the middle of the room (front or wherever the trading area is) and they start to work out a trade with other teams. At first I imagine that you’ll want to trade the maximum so everyone will want to trade 2 players. As the game goes on and people are getting closer to piecing together their story, some will want to trade 1 and others 2, but no matter what happens a team MUST NOT exceed 5 players. It’ll be up to the captain to work out how to trade the players they want to swap (eg. If the captain wants to swap 2 players but everyone else only wants to swap 1, then the captain will need to swap their players to 2 different teams. No problem).